At Carpinteria State Beach, the campsites are situated among trees, and most of them have grass. In spite of the fact that the state park has "beach" in its name, not all the campsite are on the beach. Check the descriptions below to find out which ones are. If you would like to camp at Carpinteria, but you don't own an RV, try 101 RV Rentals. They deliver and set up travel trailers at Carpinteria and other area beach campgrounds. What Facilities Are There at Carpinteria State Beach? 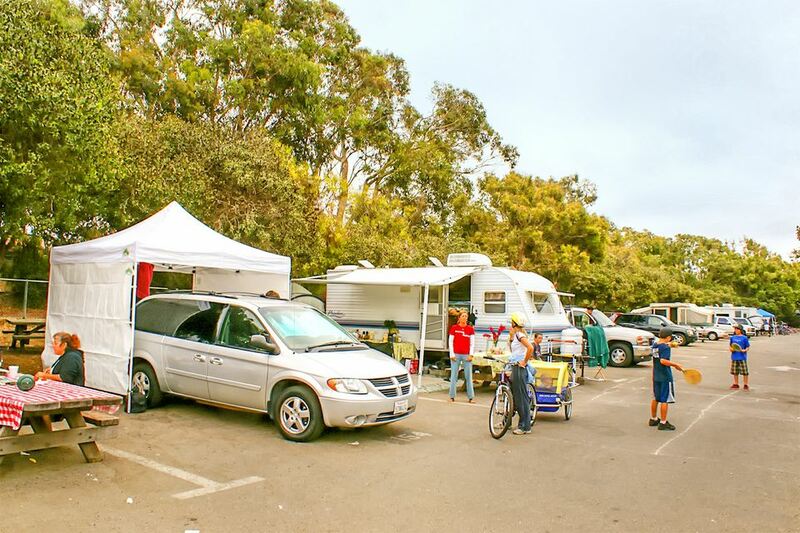 Carpinteria State Beach is a big campground with more than 200 campsites. They all have picnic tables and fire rings - and water nearby. The campground restrooms have coin-operated hot showers. Some RV sites have full hookups, but others have only water and electrical. They also have tent sites with no hookups. The RV sites can accommodate trailers and camper/motorhomes up to 35 feet long, and all of them are back-in sites. A dump site is available. Besides all that, there's a walk-in hike or bike campground that can be used for one- or two-night stays. Sites on "Beach Row" in San Miguel Campground face an inlet formed by Carpinteria Creek. Santa Cruz Campground also has some sites that are next to the beach. The state park has interpretive displays on Chumash Indian history and an imaginative play area with a canoe, rainbow bridge, and cave rock art. There's a convenience store at the park, and you can find grocery stores and restaurants in the nearby town of Carpinteria. Fishermen catch barred perch, corbina, and cabezon from the beach. At low tide, you can check out starfish, sea anemones, crabs and sea urchins in the tidepools at the southeast end of the park. You may also see harbor seals (December through May) and an occasional migrating whale swimming by offshore. Lifeguards are on duty year-round and lifeguard towers are staffed between late May and early September. You can have a fire in the fire ring at your campsite. Purchase the wood from the campsite host. Dogs are not allowed on the beach (except for service animals). They must be kept on a leash no longer than six feet, must be inside a tent or vehicle at night and you can't leave them unattended anytime. California State Park campgrounds must be reserved well in ahead of time, and you'll have to do it as much as 6 months in advance. Find out everything you need to know with our guide to California state parks reservations. Online reviews of camping at Carpinteria are so divided that it almost makes you wonder whether all those people are talking about the same place. You may want to read some reviews at Yelp and also read some reviews at Tripadvisor before you decide to stay there. If you're researching Carpinteria Beach online, you may find information with campsite numbers that seem contradictory. They changed their numbering system in February 2016, and you can find a list of old vs. new numbers on their website using the link below. Visitors say there are lots of gophers in the park and caution against accidentally stepping into a gopher hole. Seagulls and squirrels are bold and may try to steal your food. Natural tar deposits seep to the surface around Carpinteria. If you step on one, it will make a mess. Any oily substance may help dissolve and remove it. If you want to have a campfire, buy your wood at the park. It's not just a way for someone to make money, but it keeps invasive species from spreading, including some that could eventually destroy those beautiful trees you're camping under. Visit the California Firewood Taskforce website to find out why. They also have a firewood finder. Carpinteria State Beach campgrounds may close for maintenance or upgrades. During that time, reservations will not be taken, but some of the campgrounds may be open on a first come, first served basis. Get more information about current conditions on the park's website. Carpinteria State Beach is 12 miles south of Santa Barbara. Exit U.S. Highway 101 at Casitas Pass Road, turning west toward the ocean. Follow the signs, turning right onto Carpinteria Avenue and immediately left on Palm Avenue, which takes you to the entrance.